Transformer Siet for High Voltage Cold Cathode and neon tubes. Neon and cold cathode lighting can be powered by either "high" or "low" voltage transformers, depending on the project requirements. High voltage transformers can power a greater total length of Cold Cathode lamps, upto 20 meters per transformer. 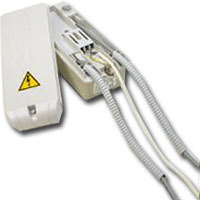 These are more bulky than low voltage types and are therfore situated remotely. A high voltage transformer can be situated upto 20 meters from the lamps, depending on the resistance of the cable. Can be used internally or externally due to the waterproof casing. Both low and high voltage transformers are dimmable and fully compatible with most lighting control systems. All transformers come with built-in Open Circuit and Earth Leakage protection. Siet Transformer (High Voltage) - Available in 1,2,3,4,5,6,7,8,9 & 10kv and 25,37,50 & 100Ma.